With 5 days to go until our Annual Banquet our AWESOME and AMAZING donors have gotten us off to a GREAT START!! $26,950 has been raised so far! Help us hit our 100k goal by making a one-time donation or signing up to be a monthly partner for the next 12 months. And, if you're in the Tampa Bay area, please come and be a part of our special night on Dec 5th (Tuesday night). In case you missed our recent Facebook Live videos we've got some GREAT NEWS to share with you! 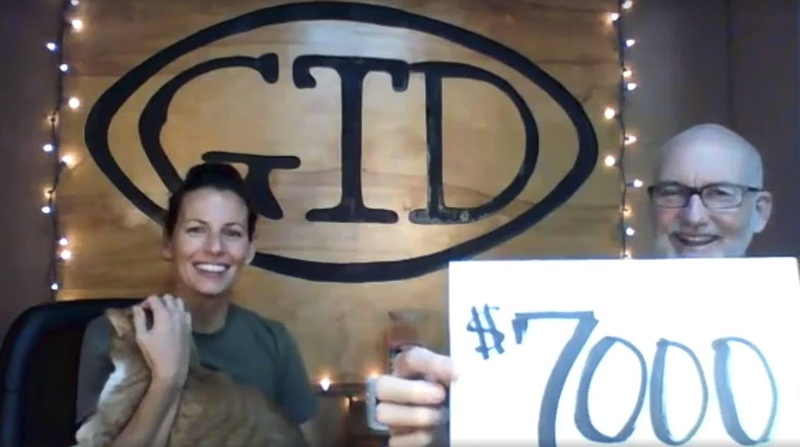 Last night we received a huge $7000 donation from an amazing and generous couple!!! WOW! We are blown away!! • $500 one time donation from another generous donor! 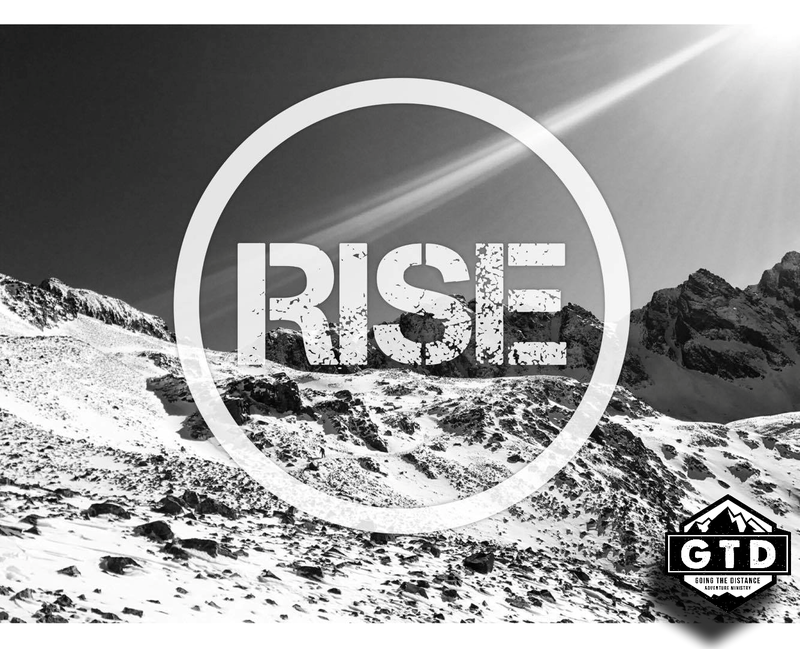 PRAISE GOD, WE ARE OFF TO A GREAT START AS WE STRIVE TO RAISE 100K DURING OUR END OF THE YEAR FUNDRAISING CAMPAIGN!! 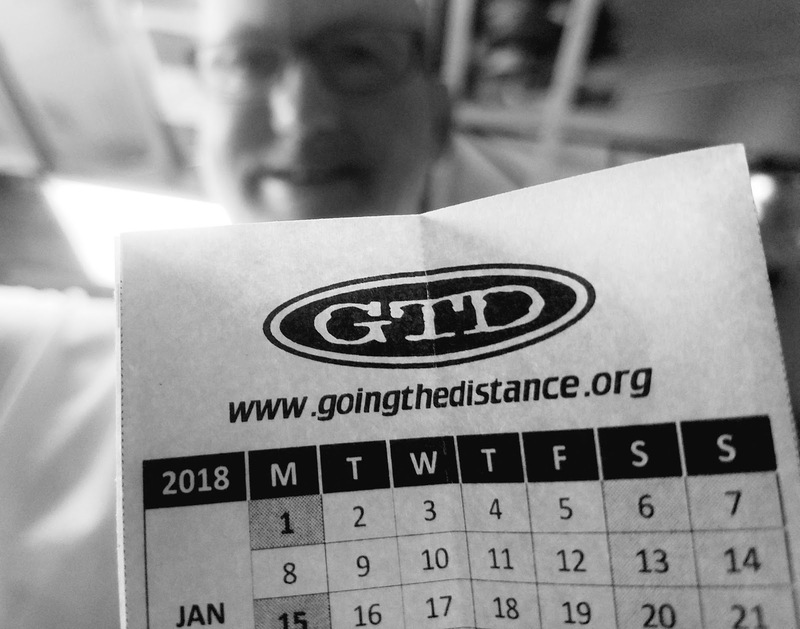 To donate to the cause and support Going The Distance Adventure Ministry as we head into our 22nd year of ministry click on the link below! We still have a $1000 Donor Match Challenge available and $35/month remaining on the $100/mth Donor Match Challenge!! Click below to donate!! We also have about 20 FREE BANQUET TICKETS available for our Annual Banquet this Tuesday night on Dec 5th at Largo Cultural Center in Largo, FL (Catered by Carrabba's)!! Email us at info@goingthedistance.org to reserve your seat(s). TODAY AT 9:30am ON Facebook Live. 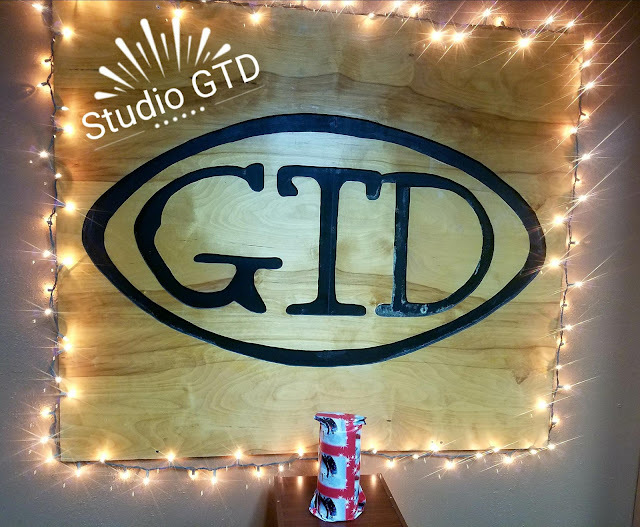 See you soon at "Studio GTD"!! 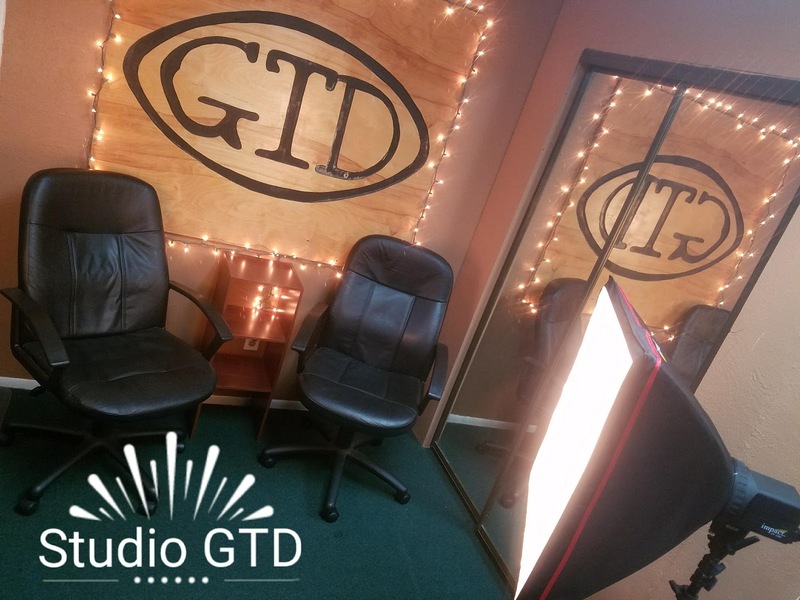 TUESDAY NIGHT LIVE FROM "Studio GTD"!! 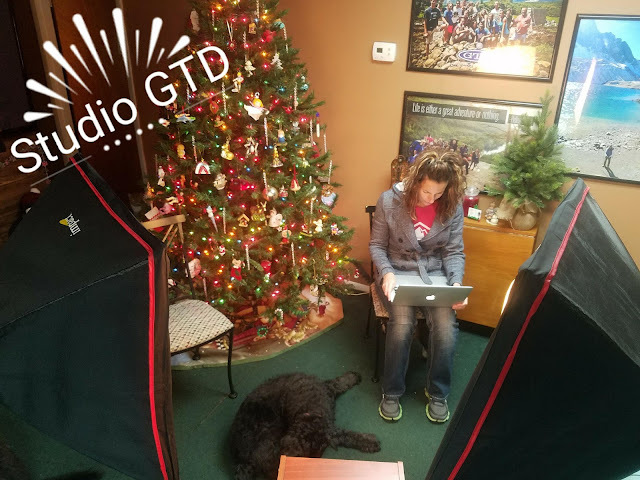 Tune-in and hear our latest updates, our current funds raised, our favorite Christmas movie, our new event planned for next summer, and more as we prepare for the most important event of the year for GTD! CHECK OUT THIS MORNING'S UPDATES!! ...WE HAVE A BIG DONATION!! THIS MORNING AT 9:30am (EST) ON Facebook Live. Tune-in and check out our latest updates, today's challenge, our overall goals, and more as we prepare for the most important event of the year for GTD! PLUS: Check out our NEW GIFT to donors of $100 or more!! TONIGHT AT 7:30pm (EST) ON Facebook Live. Tune-in and check out what's going on in the ministry as well as our lives as we prepare for the most important event of the year for GTD! PLUS: Prize opportunities for live viewers!! THE "REST" OF THE STORY! One of the biggest, best, and most powerful changes I've made over the past 4 months is letting God transform my thinking and attitude about sleep and rest. I've always hated to go to sleep. I love thinking and day-dreaming and striving after those dreams. I love following God's calling on my life and working as much as I can on the nuts and bolts of that quest. I simply hate calling an end to the day. I also hate to sleep in. Everyday feels like Christmas in the sense that I can't wait to wake up and pick up where I left off the night before. In the great words of Michael Scott from The Office, "I'm a night owl and an early bird so I'm wise and I like to eat worms." Hahaha, I love that! But I way over-worked myself over the past 10 years and especially for the first 7 months of this year. I was not only running on empty. I was running on the last remaining gas vapors in the tank. One of the great things about life is that it doesn't conform to your demands; you have to conform to its structure. And I found out the hard way that REST & SLEEP are an absolute requirement in life and for the body. There is no escaping it. I can neglect, but I can't escape it. At some point sleep deprivation catches up to everyone. I always knew the importance of sleep, but since I rarely noticed the negative effects of not getting enough sleep then I thought I was the exception to the rule... Until the wheels fell off in July. I was so worn down and worn out that I knew my body was trashed. I could feel my body literally dying. I estimated that if nothing changed I had about 2 months left before I would have to be admitted to a hospital for exhaustion. Thankfully I had enough horse sense to make immediate and drastic changes. 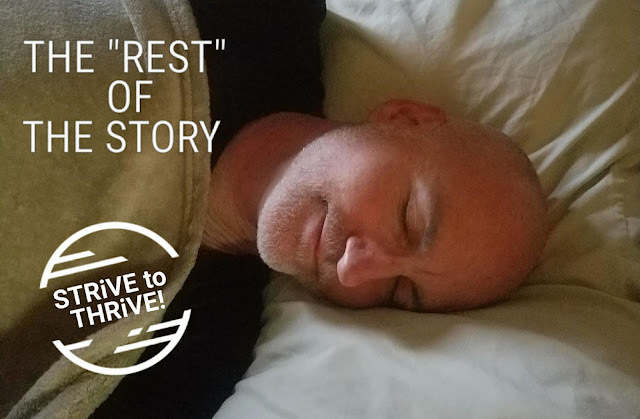 I stopped over-relying on my strength to grind it out day after day after day and started transitioning to applying wisdom to my mindset about rest. I conceded that my approach was partially right. Hard work is important and a gift from God. Nothing of value comes into creation without applied effort. God proved that during the first 6 days of creation. But I had to embrace that the PROPER AMOUNT of rest and sleep (not to the point of being a sluggard) is JUST AS IMPORTANT. God proved that on the 7th day of creation when, as some have said, God created rest. So in August, after our summer camps were done, I took 3 weeks off from physically striving. I rested. I got caught up on sleep. And I studied about the importance of sleep and rest. God says that if we want to be transformed it happens by the renewing of our minds (Romans 12:2) so I began to seek Him for a renewed mind about rest and sleep... and immediately began applying everything I learned. To my astonishment, proper sleep and rest immediately fixed a lot of things. My body now had time to repair itself, refresh itself, and recharge itself. A majority of my minor aches and pains were healed. My mind was crisp. My attitude was even more positive than usual. My drive to strive was refueled, but I had to stop running the gas tank down to empty! I had to make a lasting change. I used to go to bed around 2am and get up by 7am. Now I've disciplined myself to go to bed by midnight and get up around 7am. Actually my body wakes up ready to go around 5am, but since I'm still recovering from over-working I try to go back to sleep until 7am. Believe it or not, it takes discipline to hold yourself back. I do allow myself 2 nights each week to stay up till 2am (usually on the weekend) and I take Sundays off completely as my Sabbath as God instructs us. In addition, I've been very consistent to take Saturdays off as well. All the proper sleep and healthy amounts of rest have revived my body. It's only 4 months later and I feel so healthy, strong, and capable. And it doesn't cost a dime. That along with proper nutrition and exercise are a trifecta of natural potency! So below is my new mindset about sleep and rest. It was a hard road to get here, but I'm so glad I'm finally here! Thank You Jesus! Praise God! The "REST" Of The Story: Sleep is one of the best things we can do for our body, mind, and emotions. Sleep is when our body heals itself. It's when we recharge our batteries. It's when we prepare for the next 16-18 hours of full living. It's not the end of a long day; it's the start of a new great day! It's not the caboose at the end of a long train; it's the engine. Sleep is the foundation that productive, effective, successful, powerful, abundant, fruitful days are built on. Adequate sound sleep is one of the BEST things you can do for your body, mind, and emotions. Sleep is not your enemy, it's one of your best friends! God designated 1/3 of life, 1/3 of each day, for sleep... that alone should clue me in to the colossal importance of good sound sleep. HAPPY THANKSGIVING!! Have a scrumptious day! When you have a thankful mindset, everyday is Thanksgiving! When you see each day as a gift, everyday is Christmas! When you continually learn from yesterday and eagerly anticipate today, everyday is New Years Day! When you overflow with the love of God, everyday is Valentine's Day! When you continually honor your parents, everyday is Mother's Day & Father's Day! When you revere those who have sacrificed for your benefit, everyday is Memorial Day! When you joyfully celebrate your freedom each day, everyday is Independence Day! When you realize that purposeful work is a gift from God, everyday is Labor Day! 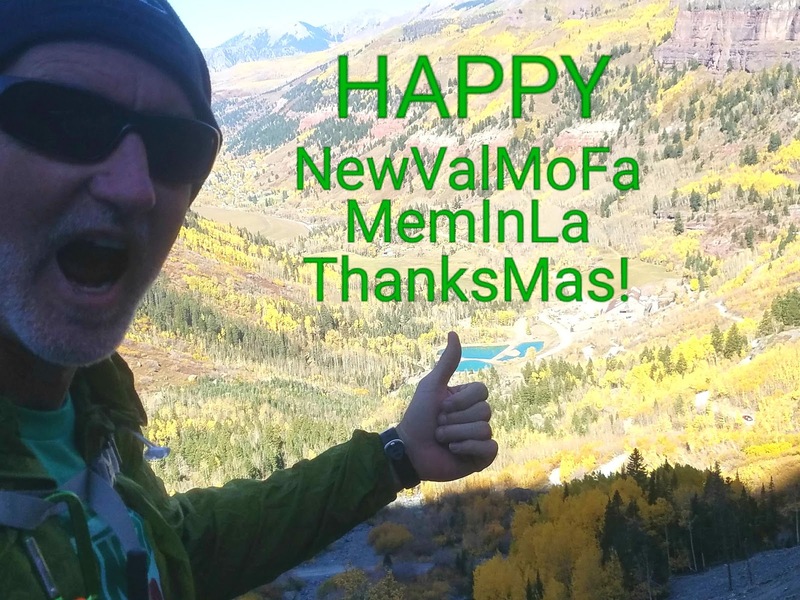 When you strive to put this all together each day, everyday is HAPPY NewValMoFaMemInLaThanksMas!! Carpe Diem! Seize The Day!! TODAY'S CONDITION IS A RESULT OF YESTERDAY'S DECISION! Good or bad, today's reaping is a continuation of yesterday's sowing. Is your momentum carrying you to a summit or to a plummet?? God has delegated to you much of the management and outcomes of your life. Our health, our financial condition, our relationships, our perspective, our occupations, etc... almost all of it is the result of this awesome thing God created called freedom of choice. He gives us directions, instructions, principles, commandments, access to immeasurable wisdom, a conscience, warnings, pain receptors, grace to fall & learn & get back up again, and is even eager to plant His Holy Spirit within us, and so many more ways to discern SO THAT we make life giving decisions and turn away from death producing decisions ... and ultimately He gives us the dignity of choice. That truth is liberating! If you caused the mess you're in then you've been given the capacity to also un-cause it (or learn from it and not be a repeat offender which literally changes the trajectory of your future!). If you don't like where tomorrow is headed change your todays. And if you love where tomorrow is headed maintain your todays. It is very simple. It's not rocket science. Sow - reap - assess - change or continue - repeat. They kill your calling, pace, identity, & dreams. Good decisions add L.I.F.E. onto your life! Strive for wisdom. Apply that wisdom. Enjoy the fruit from that applied wisdom. LEARN FROM ME... DON'T BE A MORE-ON! Don't be a MORE-ON! (MORON)... someone who keeps adding "more on" to their schedule than they can manage!! I love work! I love Mondays! I love challenges! I love striving! I've always had the discipline to work hard and long hours day after day after day. When you're chasing your dreams and your calling you just don't want to stop striving. But there is something in the running world called overstriding. It's when you constantly extend your legs to nearly full stride while you're running. It sound like it's a smart way to run... maximizing each stride to its full potential. But the prolonged impact actually destroys your cartridge, joints, sockets, heels, and more. Overstriding, ironically enough, can eventually rob you of the ability to ever ruin again. Overworking, as I found out 5 months ago, actually has similar results. Over a prolonged time the impact destroys health, withers friendships, depletes strength, overlooks opportunities, crushes potential, and so much more. So God has been teaching me a new discipline for the past 3 months... the discipline to stop overworking. To stop devaluing rest. To take time off. To stop adding MORE-ON to the open portions of my schedule. To create healthy boundaries. To preserve free time. To prioritise family and friend time. And, in many ways, to return back to the type of schedule I had before I started overstriding about 10 years ago. God is teaching an old do(u)g new tricks and I'm ecstatic as I watch the nutrients of fullness of life flood back into my body. I can't hold it in. What the enemy tried to use to break me, God used for my breakthrough! I've dropped the 24/7/365 mentality. It looks great on a t-shirt, but God has been showing me that it's not His way... It's not Biblical. 24/6/313 is more accurate, but when you subtract sleep, free time, vacations, another day for a complete weekend, etc, etc then it's actually more like 12/5/233. I'm creating a sustainable lifestyle that includes hard work, but not overstriding. And I'm actually finding that with increased wisdom and increased discipline, LESS IS MORE! I'm actually getting more done in less time. That's not to say that I in any way agree with the couch potato 0/0/0 approach to life. In many ways, the couch is just a cushioned casket filled with laziness and absent of purpose. Prolonged comfort is actually a thousand times more dangerous than overworking. At least with overworking you have motion that can be steered and have something to show for your life. With ease, comfort, & an over abundance of entertainment you build a much worse type of regret. So I'm THRILLED with all the course collections, adjustments, and life alterations... and I can't stop talking about it. Each day I'm becoming less of a MORE-ON and more of THRIVER! We have so many people to hug and thank!! It has been a year of overcoming... of getting knocked back, but pressing on... of getting knocked down, but rising back up. Sometimes the sweetest victories are produced from the hardest fights. And along the way you have a family of supporters that never stops backing you. Life & ministry are the ultimate team sports. Make plans to join us Dec 5th (Tues night) at 6:30pm at the Central Park Performing Arts Center (formerly known as Largo Cultural Center) for our Annual Banquet as GTD celebrates 21 years of ministry!! GOD'S LOVE LANGUAGE IS OBEDIENCE! Our greatest calling in life... the very fiber of our DNA is designed and created with one chief ambition: to ACCEPT God's love and to REFLECT God's love. You can't reflect what you don't accept. In other words, we can't generate love in our own power. The theory of evolution is too impotent and too self absorbed to create selfless love. We need a source. GOD IS LOVE. He is the source. The first part is to ACCEPT God's love. It was fully displayed by Christ's selfless sacrifice on the cross. The second part is to REFLECT God's love. As God's love overflows in your life you can't resist wanting to pour out what you've received back to God and on to others. We REFLECT love back to God through the act of obedience. Just like in the movie "The Princess Bride" when we say, "As you wish", we are really saying, "I love you." So in order to fulfill the Greatest Commandment of loving God with all of our heart, all of our mind, all of our body, and all of our soul we simply OBEY God with all of our heart, all of our mind, all of our body, and all of our soul. With each act of obedience (especially at times when we are tempted to be disobedient) we are saying to God: I LOVE YOU! And that is the essence of life itself. LIFE IS THE ULTIMATE OBSTACLE COURSE! ... CRUSH IT! Every week is a new obstacle course broken down into 7 stages called Mon, Tues, Wed, Thur, Fri, Sat, & Sun. Your goal is to navigate all the obstacles within each day to successfully complete each of the 7 stages and put together a winning week. But you don't want to settle for just one winning week; you want a WINNING STREAK! Your season is made up of 52 weeks. You're striving for winning streaks (consistent wins each week) in order to put together a Championship Season. And you're not satisfied with just one Championship Season... you want a repeat, a three-peat, a four-peat, and on and on. You're quest is to build a Dynasty! You're striving for thriving! A legacy of winning that inspires and impacts multitudes, but most importantly honors and glorifies the Head Coach that poured His life into you... literally His blood, sweat, and tears... and His very breath that breathed life into your lifeless nostrils. To hear Him utter the words, "Well done my good and faithful servant!" And it all starts at the strike of midnight every week as Sunday gives birth to Monday. No one can run your race for you. Only you can do that. Each day presents new obstacles along with the other obstacles you've faced before. But that's part of what makes it so fun! It's a challenge! It isn't easy. You'll lose many times on your way to your wins. That's why learning to walk as babies is the very first illustration God displays to us on how to achieve. You will fall your way to success. That drive to walk regardless of all the falls is what makes winning each stage, winning each course, and winning each season such a thrill. Winning isn't a gimme. You have to leave the bleachers and enter the course. You have to fall many times in front of the people who cheer you on as well as the do nothing critics that never leave the comfort of the stands to attempt anything worthwhile. Each obstacle will take strategic navigation along with developing skill sets and an unconquerable attitude. But that's what you were designed for. To contend. Not for early retirement. You'll get knocked down. Gravity will always be there to assist your fall. But gravity can't keep you down. Only you can keep you down. Your very first achievement in life will remind you that all you must do is rise again. Walking lies on the other side of falling. Summon that inner relentless child in you that regardless of scrapes, bruises, and blood drops you get back up again and take another step. Your Father believes in you, but it's you that must rise again and again until you walk and then run and then strive. Welcome to Monday. The first stage of this week's obstacle course. CRUSH IT on your way to a WINNING WEEK! 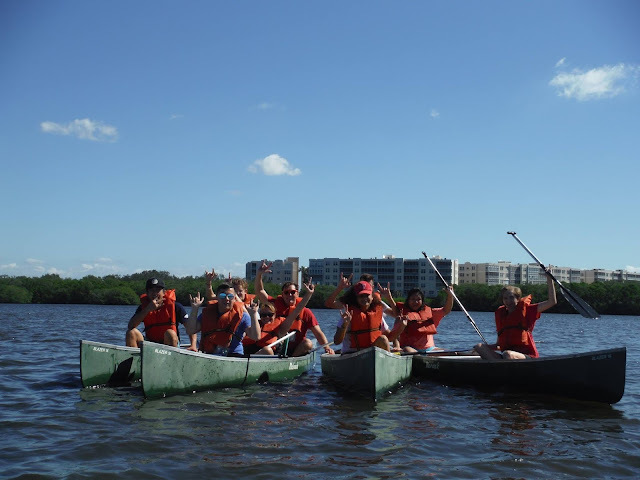 CANOEING WITH OUR FAVORITE DEAF GROUP! It's a perfect day on the Gulf Coast of Florida for a canoe trip! Having a blast with our deaf friends from the Family Center on Deafness of Pinellas Park. Thanks to our generous donors we were able to provide this event for FREE!! The afternoon was full of fun, first time experiences, water wars, leaping mullet, diving Ospreys, splash wars, and even a few capsizes! NEW GTD AWARDS! WE CAN'T WAIT TO HONOR & THANK OUR SUPPORTERS!!! 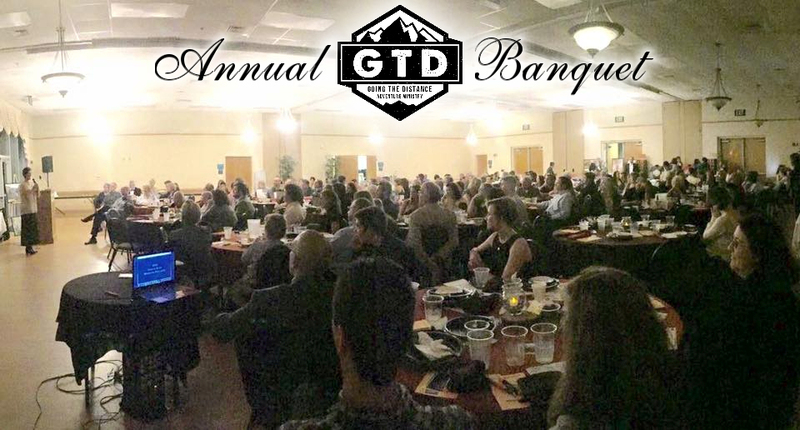 We're excited to announce that this year GTD will be introducing 3 NEW Awards & 1 NEW Recognition Gift. Two of the new awards will be our first ever LEGACY AWARDS. I'm humbled to say that as we approach 22 years of ministry we have reached a point at which we now have to talk in terms of "lifetime" of impact. We are blessed to have supporters who have left such an indelible mark over such a long period of time that they have literally left an unending legacy in our ministry. We are honored and thrilled to recognize these people with these 2 new awards: "The STALWART LEGACY AWARD" and "The CONTINUUM LEGACY AWARD". Our 3rd new award is the "7 PILLARS AWARD" (taken from Prov 9:1). This award is designed to recognize our top 7 donors for the amount they yearly invest in GTD. Without these 7 Pillars supporting GTD in conjunction with all of our other generous supporters (pillars), this ministry would not continue on each year. We also have a new Ministry Partner Recognition Gift to present to all of our donors who contribute $100 or more annually to GTD. It's our small way of saying THANK YOU to our generous and outstanding family of loving supporters. And we are also chomping at the bits to present our annual Jearld & Ann Garner JAG AWARDS and Traci Vescovi EXTRA MILE AWARDS to the people who have made the largest impact in GTD over the past 12 months. And there are more awards and recognition planned for our special night... so don't miss it!! Plan to join us for delectable dinner and unforgettable night as GTD celebrates 21 years of ministry! LOVIN' MY NEW WORKOUT PACE... UPPER BODY IN 25 MINUTES! Just over 2 months ago I started experimenting with a 25 minute weight lifting workout. My goal was simple: CONSISTENCY! It had to be something I could do anywhere, anytime, anyhow. I had to create a workout strategy that was doable even while traveling, camping, and working up to 16 hour days. I had to remove any hurdles that tend to lead to inconsistency. The main hurdle was time. The college days of 2 hour workouts and 350 lbs bench presses are no longer an option. In the words of Sweet Brown, "Ain't nobody got time for that!" My workouts would have to be long enough to be effective, but short enough to be accomplished 6 days per week year-round FOR THE REST OF MY LIFE (with a periodic week off... usually scheduled around major holidays). And it had to be just the right amount of time that, psychologically speaking, my mind and my other daily responsibilities would never object. TWENTY-FIVE minutes was the solution! If you're familiar with the Pomodoro Technique (focused uninterrupted work for 25 minutes followed by a 5 minute break) then you'll appreciate this amount of time. Research has proven that 25 minutes of cardio 3x per week is effective, but could I complete an effective wt lifting workout in only 25 minutes? The answer is a resounding YES! Over the past 15 years I had been doing (inconsistently) a fast wt lifting workout in 45 minutes... so now I had to try to carve off another 20 minutes to get it down to 25 minutes. This was a big challenge. In order to do it I had to make some big changes. I reduced almost all of my exercises from 6 sets down to 3 sets, but compensated by increasing my reps per set in order to wear the muscles down to failure (that's what creates muscle growth). In addition, I had to take minimal rest breaks between each set (about 30 seconds instead of my usual 90+ seconds) as well as use my rest breaks to set-up the weights for my next exercise. In essence, they are active rest breaks. I also would have to set a countdown timer to be intentional and stay focused. (And obviously I workout at home so no time is wasted driving or waiting for equipment.) 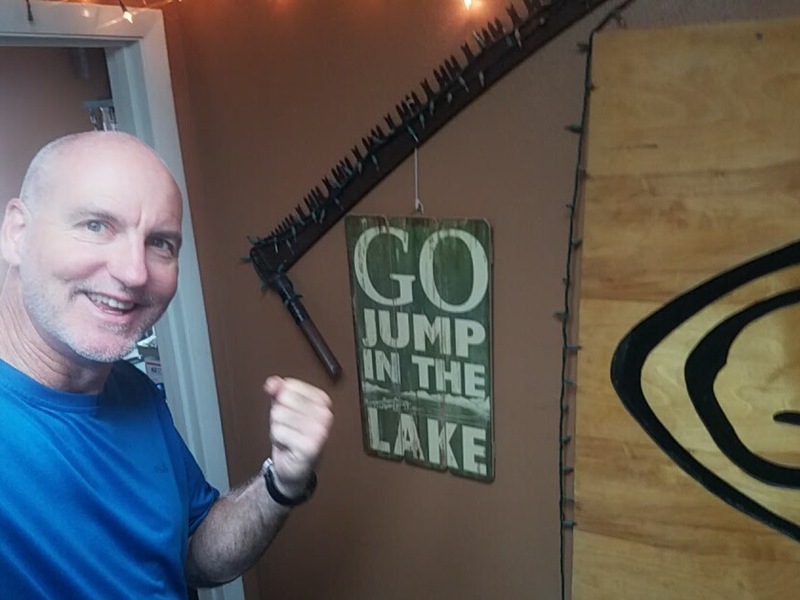 To my overwhelmingly excited surprise the faster workout time actually increased the intensity of the workout which brings about the goal of muscle failure (which produces muscle growth). In the great words of Michael Scott, "WIN, WIN!" So now I've created an effective 25 minute wt lifting routine 3 days per week that I'm ABSOLUTELY THRILLED about. I alternate between lower body and upper body every other day with a cardio workout in between and I take Sundays off completely. Then I pick up where I left off on Monday. Side Note: 15 years ago I tore my left pectoral tendon (the tendon that holds your chest muscle in place) while bench pressing 315 lbs. It has been surgically repaired. I've also separated both shoulders at different times playing sports. So I've intentionally laid off of striving after heavy weight lifting goals like I used to. My goals now revolve around overall strength and fitness. The spiritual component in working out is multifaceted. Obviously, we are the managers of our body. God gave us one body for this life. Our body is the temple of the Holy Spirit. Many of the physical diseases and damages experienced in this country are self inflicted and a result of our own choices. God created a specific menu for our body and designed us for physical exertion. We literally grow through resistance. In a sedentary environment we need to workout in order to maintain health. In addition, wt lifting (also known as "resistance training") teaches us the value of trials and difficulties and failure, increases our mental - emotional - physical endurance which teaches us spiritual perseverance (going the distance! ), teaches us self discipline with endless benefits, displays a good example and representation as a follower of Christ, prepares us to physically help others in need here and on the mission field, and countless other things. I've never needed an alarm clock to wake me up early. Zeal for life wakes me up each morning. My passions, my dreams, my mission, my calling launches me out of bed each morning! God breathed enthusiasm drives me from slumber to striving. Every. Day. Is. Christmas. When. You. Realize. Every. Day. Is. A. Gift. From. God. Life is too long to live divorced from your God given dreams, passion, and calling. You rob the world, your community, the body of Christ, and even yourself when you ignore the gifts, talents, abilities, passions, dreams, and calling that God has planted inside of you. Chasing the dreams God planted deep within you will lead you on one of the greatest faith journeys of your life. In the process you will grow amazingly close to God as He navigates you through your greatest fears, hurdles, limitations, and barriers. In Christ, you will confront and slay all the giants that attempt to occupy your Promise Land. In fact, you will come to find the actual journey to your destination is as great and thrilling as the final destination itself. And all of it done step by step with your Creator! Sorry for the latest change!! But we could not pass up the NEW OPPORTUNITY to switch back to our regular Tuesday night schedule. So our FINALIZED banquet date is back on Tuesday night... Dec 5th to be exact!! Basically, Dec 5th was our first choice, but Carrabba's was not available so we selected Dec 4th as our second choice. Carrabba's contacted us today to let us know that they had a cancellation and could now accommodate our Dec 5th date. We are thrilled to switch back to Tuesday night, but sorry to have to re-announce a new date. We do however believe Tuesday night is the best choice for this event. From past experience, feedback, and attendance we hope that this finalized date will continue to be more accommodating to our supporters, participants, and attendees. MOTIVATION IS AN IGNITION, NOT A MOTOR! Motivation is an ignition, not a motor. At best, it's a highly combustible blast of energy to get your motor started, but it can't sustain your journey. Discipline is the motor that propels you. Wisdom is the GPS that directs your path towards fullness of life & God's will while routing you away from dead end streets and fatal embankments. And your God-given freedom of choice is the main variable of where your life will end up. It's all in the Driver's Manual (the Bible) and it can turn an under used parked car into a road trip adventure of a lifetime!! Food is the fuel God created to propel our bodies. Most of the food I crave and is the most easily accessible is the type of food that hurts the body's performance and crushes its potential. That's where wise planning, simple preparation, and blue collar discipline become my best friends. I get 1 cheat day per week (usually Sunday for me). I eat 5-6 quick smaller meals throughout the day. That means I need to plan out and prepare for 30-36 meals and then execute the plan. (I also give myself 1 floater cheat meal throughout the week if I "need" it or if I'm at a restaurant and can't completely avoid all the junk). I try to eat organic as much as possible and most of my meat proteins come from fish, turkey, and chicken. Honestly, I hate the taste of vegetables, but I strive to eat 2 servings per day in addition to fruits. 6 days per week I only drink water (I'd rather drink Mountain Dew!). I try to avoid 3 things each day (except my cheat day): bad fats, fried foods, and sugar which are the very things I actually crave most of the time (that's why discipline is my welcome companion throughout the week). It's just like avoiding any other temptation or sin. You realize that it tastes good in the moment, but robs and destroys your future. To be successful you can't allow the pleasures of the moment to destroy the tomorrow's of your life. Tomorrow will literally reward you for the discipline of today. With my meal plan I try to eat 1 part lean protein and 1 part good carbs with each meal. I add veggies with 2 of the meals throughout the day. 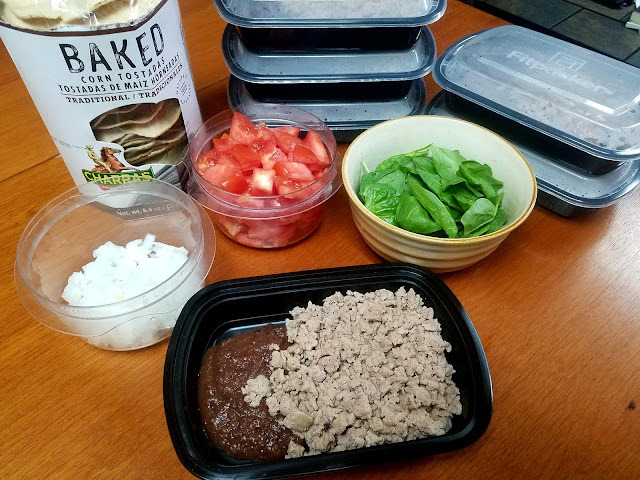 4 of my meals/snacks take less than 15 minutes to make and consume for each one. My other 2 meals are enjoyed in about 30-45 minutes each. So it doesn't take a lot of time throughout the day. I love this approach and my body and my conscience thanks me everyday! And since our bodies are the temple of the Holy Spirit, God affirms my actions each day with a small inner whisper that says, "Well done!". No amount of junk food compares with that. <> One of our best private groups which had reserved 6 GTD events for 2017 went bankrupt. <> One of our major events under performed which resulted in a loss of $20,000 potential income. 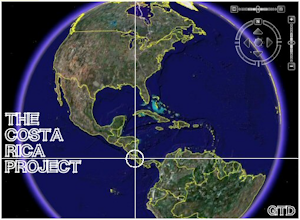 <> What was projected to be our first ever break-out year financially with a large enough surplus to pay off all debts became a year of survival. <> We had our lowest numbers of volunteers ever. Many events run by only 1 or 2 people (we need 5). <> Laurie experienced 12 months of health issues, burnout, & personal exhaustion. This led to 7 months of 60+ hour work weeks for me and my own personal exhaustion. 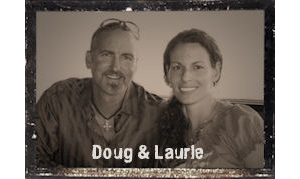 <> Laurie & I broke off their wedding plans and focused on recovery & renewed strength. <> Our record breaking banquet at the end of 2016 prepared us for the hard hits... $65k raised!! <> We had $10,000 built up in our "rough year" savings account for a year like this. <> We had one of our best spring retreat seasons ever! 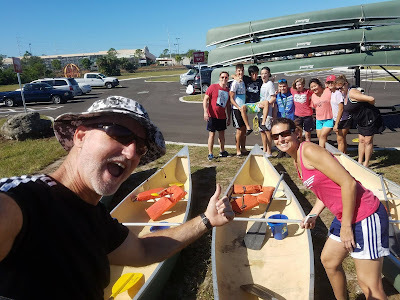 <> We ran our 1st PERFECT mission trip in Jan! <> We ran our 1st Spanish Immersion Trip & 1st Colorado Trip. <> We had GREAT spiritual impact on each event! <> The openings in our calendar allowed us to conquer a lot of admin work that piles up during travels. <> We hired my 14 year old nephew Carson as our summer ministry assistant. 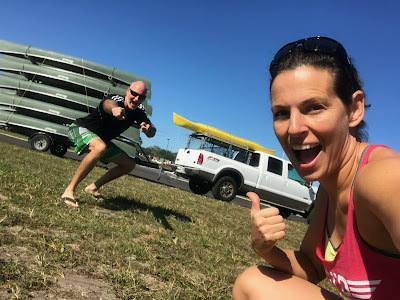 <> We already have a very frugal budget, but I was been able to shave off more monthly savings such as reducing our office phone bill to $5/mth, our internet bill to $45/mth, and more! <> Laurie & I are actively recovering well and making all types of small & big wise adjustments to prevent future exhaustion and burnout. It's hard to beat someone who doesn't give up. We don't give up. We don't give in. We press on like our Savior. We're not done yet. We've got so much more still to achieve! IT'S NOT HOW YOU START THAT COUNTS; IT'S HOW YOU FINISH! WE'RE FINISHING 2017 STRONG! CELEBRATING 21 YEARS OF MINISTRY! 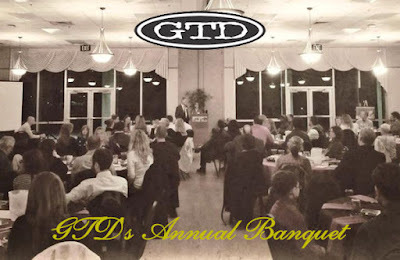 Come enjoy a delectable dinner and unforgettable night as GTD celebrates 21 years of ministry! SWEAT IS MY MORNING SHOWER! 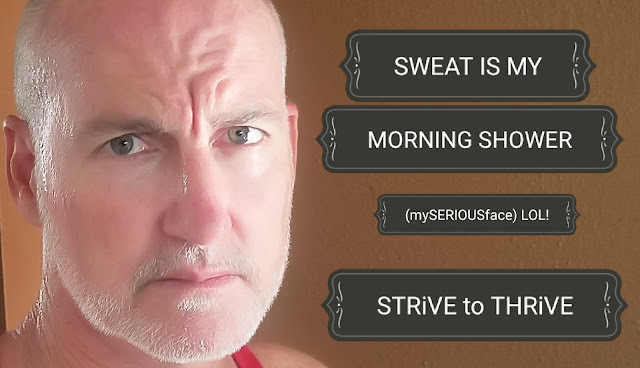 One of the best ways to start the day is with a sweat producing workout! It's one of the natural ways God designed the body to cleanse itself and recharge... increased endorphins, released endorphins, eases pain, controls mood swings, relieves stress, detoxifies the body, prevents salt accumulation in the kidneys, fights colds -viruses - bacteria - fungi, and can even cleanse the pores. And it's FREE! Available 24/7! Takes very little time! Huge lifelong benefits! Only requires effort! 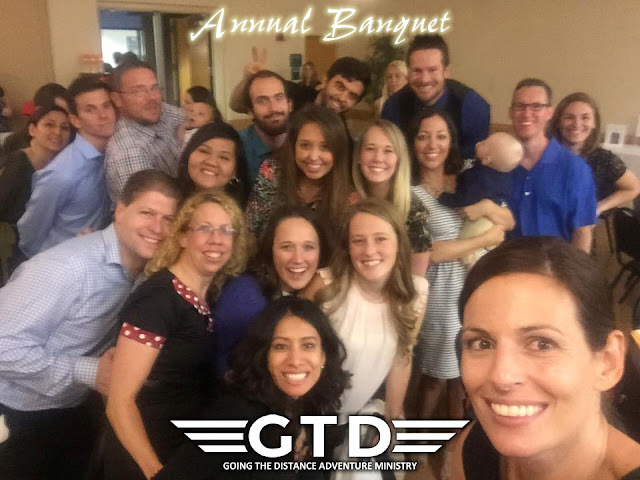 SAVE THE (NEW) DATE - GTD'S ANNUAL BANQUET!! Like we did last year (and a few other years in the past), we are pushing the date of our Annual Banquet back a few weeks (from Nov 14th to Dec 4). We have so many people to honor and thank. This has been a hallmark year of overcoming. The tougher the battle, the greater the victory. 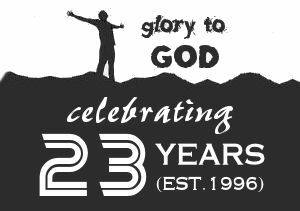 Celebrating 21 Years of Ministry!! Glory to God! EACH DAY FEELS LIKE I JUST HIT A GAME WINNING HOMERUN! I know it sounds a little cheesy and maybe even a little obnoxious (where's the barf bag! ), but I'm experiencing some of the deepest inner satisfaction and best performance results I've ever experienced in life... almost every. single. day. I'm 3 months into making some small and large adjustments in life. And each day I wake up to the fruit that is the result of the good decisions I made yesterday, and the good decision I made the day before that, and the day before that, and so on, and so on for the past 12 weeks. I'm literally experiencing the compound interest of consistent good and great decisions. It's actually more than compound interest, it's compound blessing. I'm reaping what I've been sowing. It's all based on God's Word and a result of my prayer time with God. And it's an awesome experience. Especially since I was physically worn down and beyond exhausted just 4 months ago. I was so overworked and under rested that I believed I was only a couple of months from being hospitalized for exhaustion. I could feel my body withering. So I drew a line in the sand and started fighting back for every piece of fullness of life Jesus provides, but we have to intentionally and purposefully strive after. We live in a sowing & reaping environment. So if I'm reaping exhaustion and fruitfulness then I'm sowing overwork and neglect. When that's the result, that's not God's fault - it's mine. The great thing about sowing and reaping is that if you drive yourself down a dead end street then you can put the car in reverse and drive back to the wrong turn and change your heading. And that's what I did. I entered new coordinates into my daily GPS and focused on increased discipline and increased application of wisdom to every area of my life. I sought wisdom and then applied wisdom. Day in and day out. Whether I felt like it or not. It wasn't emotion-led. It was founded on discipline. So it isn't affected by the emotion of each day. Emotions are fair weather friends. There one day and gone the next day. Motivation is the result of emotions so you can't count on motivation to get you up out of bed on days you don't "feel" like doing whatever you need to be doing. But discipline is different. It's an all weather friend that most consider boring. But it can be the best friend you ever have. Discipline takes you from inconsistency to consistency. And when you consistently start making good choices day after day after day then you quickly begin to reap the rewards of those good choices. I had to discipline myself to stop overworking so much. I had to discipline myself to go to bed by midnight each night. I had to discipline myself to workout as soon as I wake up each day. I had to discipline myself to choose to eat healthy 6 days per week. I had to discipline myself to not check my emails, social media, or watch the news until I've taken care of my top priorities each day. I had to discipline myself to set my first ten actions for each day regardless of circumstances and situations. I committed myself to wisdom. But it was discipline that put wisdom into action. Don't get me wrong. My life isn't a list of rigid disciplines. I've also included plenty of space for freedom, recreation, relationships, interruptions, etc. But it's discipline through the power of the Holy Spirit that keeps it all going and growing. So I'm 3 months into this transformation and it isn't fleeting because it's not built on emotion. It's built on something way stronger and way more dependable - DISCIPLINE. I've always had it, but not to this degree. And now, each day I wake up (and even all throughout the day), there is an inner reward that happens that's almost indescribable... my conscience, my self talk, and the Holy Spirit each constantly whisper, "Well done!" That's priceless. Plus, the actual performance benefits that result from wise decisions consistently implemented is extraordinary.